In order to truly confirm the decline of the sedan and hatchback in the United States, you need only look at the three best-selling non-trucks of 2018. The Toyota RAV4 came in at number one, the Nissan Rogue came in at number two, and the Honda CR-V came in at number three. The Rogue's place at number two is actually a bit deceiving because Nissan also includes sales figures of the smaller Rogue Sport. Unlike the Rogue, which competes in the compact class, the Rogue Sport represents the budding sub-compact class. We've already tested the Rogue Sport and found it be to a competent sub-compact SUV with plenty of space. 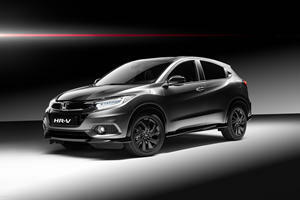 Not to be outdone Honda has created its own sub-compact SUV (to sit below the CR-V) called the HR-V.
HR-V stands for either Hi-rider Revolutionary Vehicle or Hip and Smart Runabout Vehicle, both of which sound a bit mealy-mouthed. We would have preferred a name such as 'Civic' or 'Pilot,' especially considering 'HR-V' is easy to confuse with Toyota's sub-compact CH-R. 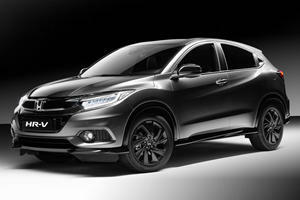 Confusing alphabetic name aside, the HR-V is a handsome crossover within its segment. We think the HR-V splits the difference in styling between more radical models like the Toyota CH-R and Hyundai Kona, and more plainly-styled vehicles like the Ford EcoSport and Chevy Trax. 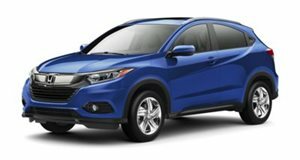 The HR-V has been around since the 2016 model year but has recently been refreshed for the 2019 model year. The facelift included a new grille, bumpers, headlights, and taillights, as well as two new trim levels. Honda also added a top-of-the-line Touring trim as well as a lower-spec Sport trim, which sits between the base LX and next-level EX trim. We tested the new Sport trim, which was designed to offer a more premium and sporty looking exterior without driving up the price. The HR-V comes in a slew of interesting colors, including the Orangeburst Metallic shade found on our test car. When combined with the Sport Trim's exclusive black body trim and 18-inch wheels, everyone we spoke to seemed to dig the HR-V's styling. Honda didn't make any changes under the hood of the HR-V for 2019, so a 2.0-liter four-cylinder good for 141 horsepower and 127 lb-ft of torque is the only engine choice. Power goes out through a smooth continuously variable transmission (the manual option was discontinued for 2019) to either front- or all-wheel-drive. FWD models can hit 60 mph in 8.6 seconds, which is average for the segment and quicker than the Rogue Sport and CH-R. Opting for AWD does bring the 0-60 mph time up to a sluggish 9.5 seconds. The HR-V is neither the slowest nor the quickest crossover in this segment, though we doubt too many shoppers will buy a sub-compact SUV based solely on performance. In the Sport trim, the HR-V manages to achieve excellent fuel economy figures of 28/34/30 mpg city/highway/combined with FWD. AWD models like our tester still achieve 26/31/28 mpg city/highway/combined, though we were able to average a little over 28 mpg in our week with the car. Since the Sport trim sits near the bottom of the HR-V lineup, we didn't hop in expecting a luxury palace. There are plenty of hard-touch plastics but Honda has done an excellent job of making sure key touch points are wrapped in softer materials. 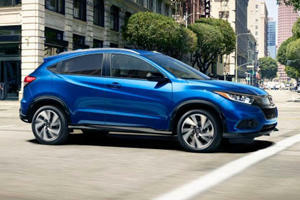 At the center of the HR-V sits a seven-inch touchscreen display, which lacks built-in navigation or satellite radio. The lack of navigation is easy to forgive because Apple CarPlay and Android Auto are standard on Sport trims and above. Honda has listened to customer complaints and replaced the touch-sensitive slider for a volume knob - hallelujah! Along with a simple display, the HR-V Sport makes do with old-fashioned manual climate controls. Other unique features of the Sport Trim include a leather-wrapped steering wheel and shift knob, paddle shifters on the wheel (more on those later), metal-trim pedals, and two USB ports located underneath the transmission tunnel. We wish the HR-V had a more accessible storage area but the integration of a storage bin beneath the shifter is fairly practical. This area also includes two smaller storage areas to either side of the transmission tunnel, which are perfect for holding a cell phone. The HR-V doesn't include leather seats unless you opt for the EX-L trim but we found the cloth seats in the Sport trim to be very comfortable and supportive. Although the seats lack adjustable lumbar support, they do have slight bolstering to help hold occupants in place. Don't let its diminutive size fool you, the HR-V is like Dr. Who's Tardis, bigger on the inside than the outside. All HR-V models come standard with Honda's Magic Seats (yes, that's really what they are called), which were first seen on the Fit. These seats cleverly fold to create a flat load floor (a feat many pricier SUVs cannot accomplish). The Magic Seats also feature a liftable seat bottom to create a handy storage area in the second row for tall objects. Mystical seat folding aside, the HR-V offers adequate space in the back with 39.3-inches of leg room. Our only complaint with the rear seat was uncomfortable headrests, which need to be raised before sitting down. Honda integrated the headrest so they wouldn't hit the front seats when folded, so their comfortability in the down position can easily be forgiven. Behind the rear seats, the HR-V offers 24.3 cubic feet of storage, which opens up to 58.8 cubic feet with the second row folded. Opting for AWD does cut the storage space down to 23.2 and 57.6 cubic feet respectively. Even so, the HR-V is massive for the segment. If size and practicality are your biggest priority, the HR-V won't let you down. If you are looking for the most fun-to-drive option in the sub-compact category, you may want to take a look at rivals like the Mazda CX-3, Hyundai Kona, or Kia Soul. The HR-V lacks the spunky driving characteristics we expect from Honda. The surprising level of driving enjoyment found in an Accord or non-Type R Civic is missing in the HR-V. The steering is light and lacks any sort of precision, which is fine for most people cross-shopping in this segment. Acceleration won't wow anyone but this entire segment is generally lacking in terms of power (the Hyundai Kona and Kia Soul are the lone exceptions with 175 and 201 hp respectively). Perhaps we asked a bit too much from Honda's smallest and most affordable crossover but we wish it had more of the Fit's peppy nature on which it is based. Jumping on the paddle shifters does little to liven up the experience, making us question why Honda even bother including them. Fortunately, the HR-V rides smoothly and is quiet on the highway, thus redeeming its less-than sporty driving characteristics. During our time with the HR-V, we only experienced one issue relating to the Bluetooth handsfree calling. Everyone on the other end of our calls noted that there was an intolerable echo on their end, making a conversation nearly impossible. This may have just been an issue with our test car but we felt it was worth mentioning. For reference, we were using a Google Pixel and experienced this issue with everyone who we tried to call on Bluetooth (four separate people). We eventually had to take the call off Bluetooth and resort to using speakerphone. We heavily recommend stepping up to the EX trim for $23,720, which adds important features such as heated seats, smart entry with push-button start, satellite radio, Honda Lane Watch, and Honda Sensing. The EX-L trim adds leather seats, and auto-dimming rearview mirror, 180-watt six-speaker audio system, and unique 17-inch wheels starting at $25,320. The Top Touring trim starts at $28,540 and decks the HR-V out with navigation, eight-way power driver seat, automatic LED headlights, Homelink, LED fog lights, and standard AWD. AWD can also be added to any trim level for $1,400. Our tester included AWD, bringing the as-test price to $24,665. The HR-V won't win you any drag races or make your hair stand on end on a winding backroad. What it will do is offer an excellent amount of storage space for a small car and ride more smoothly than an SUV of this stature has any right to. The new Sport trim for 2019 is slightly too basic for our tastes, so unless you live in a heavily snow-covered area, we'd forgo the AWD (which lowers mpg and storage space) and spend the money to upgrade to an EX trim. Few SUVs in the sub-compact segment can be considered perfect but the HR-V treads rather close to this territory. We wish Honda had given it a bit more of a sporty flavor but the HR-V still earns a score of Great Buy.